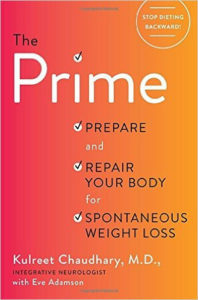 My new favorite book is THE PRIME by Kulreet Chaudray, M.D. It is a great blend of western and eastern/Ayurvedic philosophy on gut and brain health, and detoxing. She is a neurologist and helps people with ALS, MS, and Parkinson’s, and anyone trying to improve their overall health. She says that the gut talks more to the brain than the brain talks to the gut. It is easy to read and a great daily reference of 4 steps to follow. I hope to start a book club / support group for anyone wanting to incorporate these principles. Let me know if you are interested in joining. Email me at barbara@texasyogacenter.com.